Here you can book your cheap Denmark ferries from the UK right here including the Harwich to Esbjerg route. You can also book cheap ferries from Denmark to the UK. Make sure to get the prices on your ferry from Denmark by using our recommended ferry ticket booking engines online. The most popular ferry route from the UK to Denmark is the direct one from Harwich to Esbjerg. The longer drive options from Dover to Calais then up through Belgium, Holland & Germany are far less attractive than the overnight ferries to Denmark out of Harwich. This port also serves the Dutch port of Hook Van Holland with the Stena ferry crossings. Below you will find information about ferries and ferry routes to Holland. If you are looking for a cheap ferry or even the cheapest price possible to Holland remember to try to avoid weekend travel and request the most basic of ferry cabin accommodation when prompted. Ferries to Holland sail mainly from the UK ports of Newcastle, Harwich and Hull. Also available cheap ferries to Copenhagen. 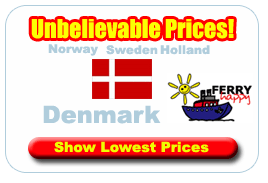 Get your cheap prices for ferry crossings from Harwich to Denmark here online today. DFDS operates this ferry crossing with the ship m.s. DANA SIRENA. With room for a massive 623 passengers and 435 cars, the m.s. DANA SIRENA offers amazing facilities including restaurants, bars, cafés, children’s areas, shops and more. This comfortable cruise ferry was built in 2002. Why not sail to Western Denmark by ferry with DFDS Seaways.